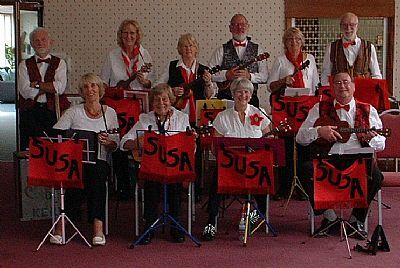 Kidderminster Ukulele Club meets every Thursday at St. George's Social Club, Radford Avenue, Kidderminster, DY10 2ES. Beginners session is from 6.45 and Club begins at 7:30 p.m. and ends at around 9:30 p.m.
Hi SUSA, Just had a feed back from our Shelsley gig from Rebecca, Director of Eventageous PR Ltd. " Thank you so much for supporting the event we really appreciate it. It was great to see the courtyard so busy and your SUSA group well received .Congratulations. " Nigel, The Stage Manager, would also like to thank us for our support. "It was great to see a local band going down so well ". Monday 18th August at Hagley Help Line Cream Tea "We always look forward to you coming"
Wednesday 23rd September at Westley Court to see Ray, our founder on his birthday. Tuesday 30th September at Astley and Dunley Village Hall, Stroke Club. "Best group we've ever had". Wednesday 1st October at Age Concern, Stourbridge. "They always ask when are you coming again"
Sunday 5th October at Hartlebury Castle. "What a wonderful show, so lively and cheerful and your MC is great"
Wednesday 12th November at the Sheltered Housing, Bromsgrove. "What great entertainment"
Monday 8th December at Croft House, Wolverhampton. Sunday December 21st at Wolverly with the Village Choir. "Great, will you come and play with us again?" Wolverley - wasn't it lovely? We'll go again next year. A really nice way to finish off our European tour! Best group we've ever had!"